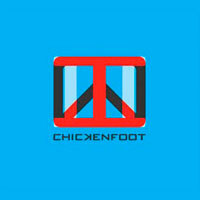 Chickenfoot is a 'supergroup' featuring Van Halen's Sammy Hagar and Michael Anthony, guitar legend Joe Satriani, and drummer Chad Smith from the Red Hot Chili Peppers. 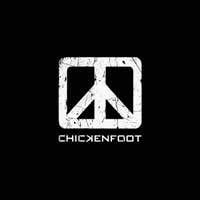 Before even listening to a note of the debut album from Chickenfoot, I have to say that "Chickenfoot" is one of the worst band names ever, no matter how tongue-in-cheek it's suppose to be. 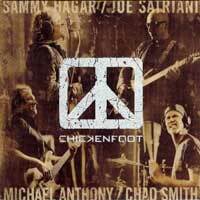 Chickenfoot is a straight-forward, blue-collar, vanilla-as-can-be, rock and roll band. At times the music sounds a lot like Hagar-era Van Halen due to the Hagar/Anthony vocal harmonizing. (see "Learning to Fall") Musically as well, it’s not too far off course from the Van Halen formula, though without the keyboards and pop tendencies. Satriani, while obviously not trying trying to be an Eddie Van Halen clone, does a superb job delivering guitar-driven riffs and quick fingered solos. Unfortunately, however, the whole thing is rather laborious. In small doses, songs like "Get It Up", "Avenida Revolucion" and "Runnin’ Out" are very enjoyable. "Down the Drain" has a big Van Halen vibe with it's guitar heavy groove and Sammy talking to Satriani on the intro. "Future in the Past" clocks in at over six minutes and features some tasty licks from Satriani. "Oh Yeah" is the big hit single from the album. It's a like-able song, not unlike most of Sammy Hagar's solo material. It's not bad and there are some very good songs. There's just far too much professionalism in this project for it to be a total train wreck. It's just unfortunate that as a whole it's really is hard to listen to all the way through in one sitting. The packaging is unique. The CD is packaged in an all black cardboard case that is printed with heat sensitive ink. When the packaging gets warm enough it reveals a sepia tone cover (pictured above left). The oddly titled sophomore release from Chickenfoot wasn't the first album on my priority list. I had thought that the debut was good, but not all that memorable and after the buzz of this 'supergroup' wore off, the disc began to collect dust in my collection. As such, I wasn't expecting much from "III". To my surprise, I found "III" to be more immediately like-able and certainly more memorable. The album starts off with a song titled "Last Temptation" that is a surprisingly modern, sounding like what is being played on rock radio at the moment. The follow-up track "Alright, Alright" has more of a pop flare. "Different Devil" sounds like it could have been written for Hagar's "VOA". "Dubai Blues" is funky, slightly bluesy rocker that borrowing heavy from the classic song "I Ain’t Got You". However, the songs that really tripped my trigger were "Three and a Half Letters" and "Something Gone Wrong". On "Three and a Half Letters", Hagar brings out the current struggles of our nation and tells the tales of job loss, homelessness and veterans returning home from war with no support or jobs for them. The song is both powerful and emotional at the same time, both lyrically and musically. "Something Gone Wrong" is the last song listed on the CD, though there is a hidden song called "No Change" at the end. "Something Gone Wrong" is a very 70's sounding song with a delta blues/Southern rock vibe. As they did in Van Halen, Michael Anthony and Hagar harmonize together perfectly. This blues based rock and roll is very fitting for Hagar's gruff voice. Sammy singing on this song is fantastic I much prefer this sound to the more pop based stuff he has done. I sort of hope they do more stuff like this in the future. Of course, Satriani is unleashed to tear up the fretboard on this song as well. The last song is a Van Halen-esque hard rocking political rant. The packaging on "III" is also interesting as it is one of those 3-D things with the red/blue glasses, not unlike Voivod's "Outer Limits" or Grand Funk's "Shinin' On". Some of the art is 3-D while other parts of the artwork, such as the CD itself, require the viewer to close on eye or the other to read the information. It's a fairly unique idea in a music market that is downplaying physical media such as CDs. This would be even more awesome in vinyl format.